From hat head to dandruff and flyaways to split ends, winter can be one of the most hazardous seasons for your hair. Why? Blame humidifiers, heaters and all of those things we turn on in cold weather to keep us warm; they zap moisture from our immediate surroundings and thereby our locks, making them prone to dryness induced damage. To help you get through this season without experiencing a six month long bad hair day, we chatted with Pantene's Global Ambassador Sam McKnight for some tips on how to prepare your hair for colder weather. From lathering on conditioner to changing your routine, here are 10 of his practical hair-care tips. "As the weather gets colder, our hair tends to dry out. Use a deep moisturizing mask at least once a week to replenish your hair." "Change your daily hair care regime to your environment, instead of sticking with the same products year-round. If you have fine hair, for example, you may want to switch your shampoo and conditioner to something that’s a bit richer to keep hair hydrated and healthy throughout the dry winter. " "Prevent split ends and keep hair healthy by getting it trimmed regularly. In between cuts, use Pantene Pro-V Split End Repair Keratin Protection Crème to further minimize the risk of split ends." 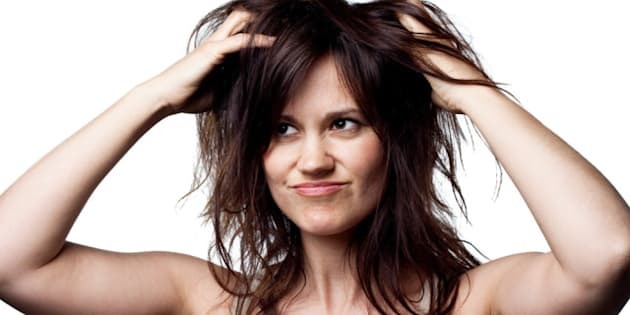 "Blow-drying and heat-styling tools contribute to hair breakage. Be sure to condition and protect hair prior to blow-drying/heat-styling." "It’s easy for hair to turn into a disaster on a blistery winter day -- keep a smoothing cream or hairspray nearby designed for your hair type to keep your tresses smooth throughout the day." "The effects of a dry, cold winter can also affect your hair colour, leaving it limp and dull. Prevent and protect with products for coloured hair to revitalize locks and add shine." "The lack of moisture in the winter air can be taxing, leaving hair dehydrated and overpowered by flyaways. Prevent hair from flying in unwanted directions by ramping up the conditioning treatments." "Even though its winter, don’t hide your hair away! With all the Christmas and New Year parties approaching you’ll need added va va voom. You can lift locks with a root lifter spray. "Wintery conditions mean that the easier your hair is to manage the better! Make sure the care products you use don’t weigh your hair down." "Keep your hair in tip-top condition no matter what the environment throws at you. Using a protective spray that can be applied to wet or dry hair is perfect and will provide your locks with the nourishment they need."